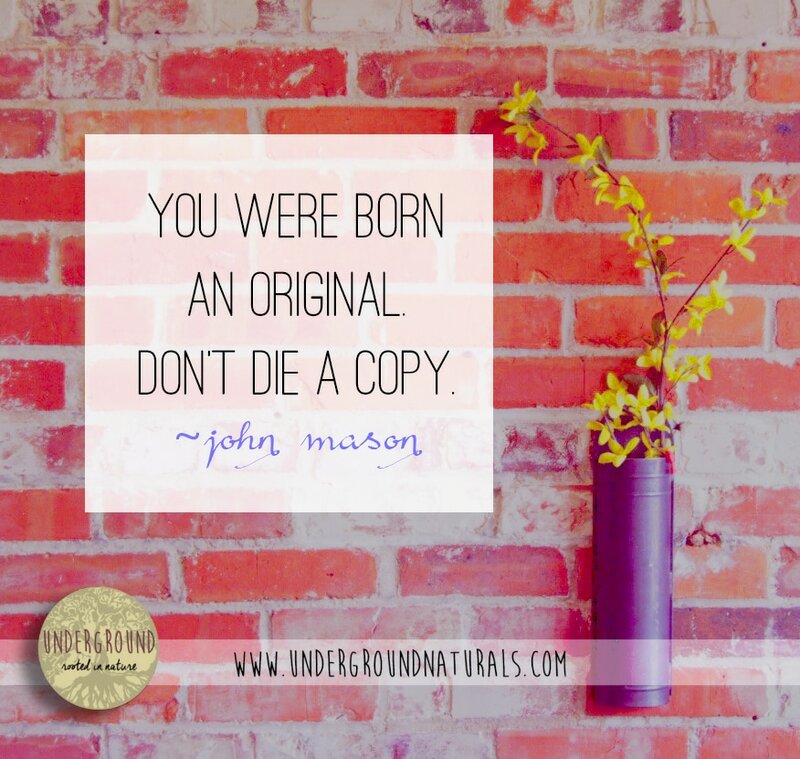 At Underground Naturals, we want you to be the natural you. Do not strive to be a duplicate of what others tell you is beauty. Be an original. Be YOU. Sunburn can be uncomfortable, painful, and annoying. Underground Naturals has you covered. ​Here we are in the middle of July, and many of us are spending time with our families and enjoying the outdoors. Sadly, this means that many of us are also experiencing the effects of over-exposure to the sun and suffering through skin damage and sunburn. The first signs of sunburn may actually not appear right away and could show up hours after exposure. The symptoms are red, tender skin that is warm to the touch. Some burns can result in blisters that can develop hours or days later. In severe cases, sunburn can result in fever, chills, nausea, or rash (this is a serious condition sometimes called sun poisoning). Many people struggle with peeling skin for a long time after the skin has been burned. People with fair skin are more likely to get sunburned as sunburn results when the amount of exposure to the sun exceeds ability of melanin to protect the skin. Melanin is the skin’s protective coloring. Fair skinned people can burn within 15 minutes of sun exposure, especially during the strongest hours of 10 am – 4 pm, while dark skinned people may endure the same exposure for hours. If you do get the dreaded sunburn, it is important to remember that hydration for your body as well as your skin is important! While you may be tempted to use commercial products on your sun soaked skin, it should be noted that petroleum jelly and petroleum-based ingredients are very bad for sunburned skin. This horrible ingredient (as well as ingredients derived from petrochemicals) can block pores and prevent heat and sweat from escaping, causing you unwanted pain and furthering skin damage. You should also be aware that using petroleum jelly on already damaged skin is really discouraged if you plan on returning to the sun. The super-shine that petroleum jelly leaves on your skin actually reflects the same way that pool water does, drawing more sun to your skin! At Underground Naturals we suggest that you always avoid this nasty ingredient, but ESPECIALLY if you are struggling with already damaged skin. So, before you go out into the sun, be sure that you protect your skin by wearing proper sun gear. But also be prepared to take care of your skin when you come back inside. 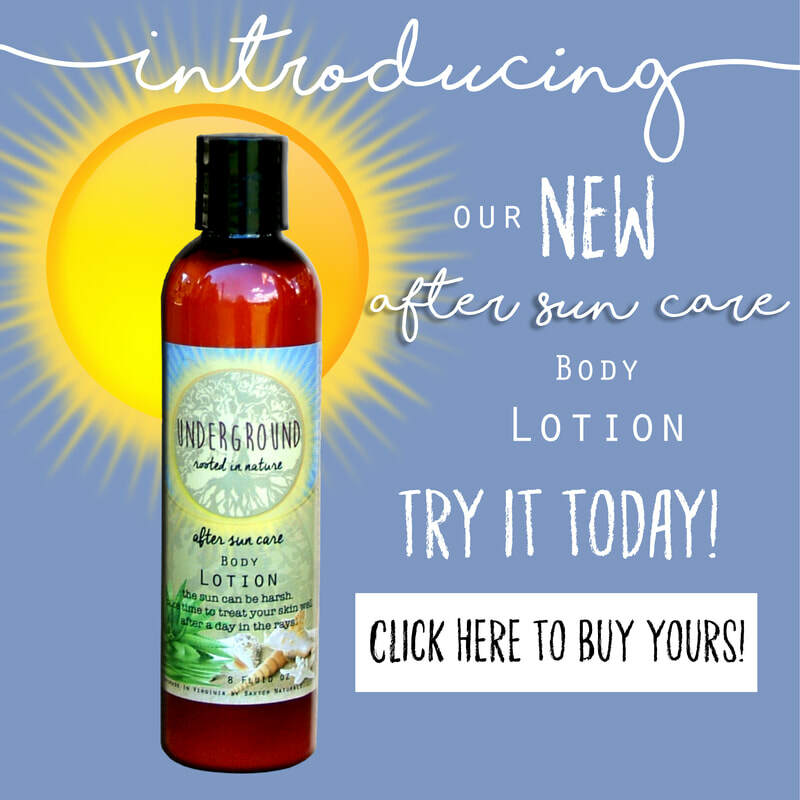 For you, we have designed and incredible After Sun Care Lotion that will quickly become your new summer “must have.” Soothing aloe, shea butter, and lavender essential oils come together in this incredible body lotion to give you a fighting chance to let your sun-kissed skin shine that beautiful healthy summer glow that you desire. Underground Naturals DIY Recipes, Make your own Avocado Hair Mask. Strong, healthy hair begins at the root. If you keep your scalp healthy, eat healthy, drink plenty of water, and get the right amount of minerals and vitamins, your hair will grow long and healthy. However, we do not live in a world that makes it convenient for us to always reach for those 8 glasses of water a day, and for many of us, getting in our daily dose of vitamins and minerals can really be a struggle. Add on top of that all of the chemicals that we use to keep our hair exactly the way we want it, and you have a built up, dried out, toxic mess that tends to leave our hair lifeless and needing some love. We want to share a recipe with you that will refresh, revive, and feed your hair what it needs while also helping to remove product buildup. So, gather your ingredients, pick out your favorite flick, and get ready to pamper your hair. You will love the results! Remove the fruit of the avocado from the pit and peel. Place into the food processor (or blender). Squeeze the 1/2 lemon into the food processor. Pour in your olive oil and honey. Blend well. Use the towel to cover your shoulders and shirt. Now, in small sections, coat your hair by using your fingers. It is easier if you scoop the desired amount with your fingers, and start at the root, massaging the mixture from the root to the tip. Use your comb to be sure that the entire section is thoroughly covered. Once your hair has been covered, you can let your hair hang or use a clip to pin your hair up, away from furniture or clothing (as much as possible!). Let the mixture stay on your hair overnight, if possible. If you don't have time for it to stay all night long, then at least let it dry on your head. It will almost feel like a helmet. Then, using your hair care routine, wash your hair. We would love for you to follow up this amazing hair mask with one of our incredible, all natural hair care products, so if you are interested, let us know and we will gladly help you get the right product for you! Check out our hair care products by clicking here! If you are brave, send us a picture with the hash tag, #undergroundnaturalsavocadochallenge, and we will enter your name into a drawing for a shampoo and conditioner set! We cannot wait to see your photos! Share this post and have your friends look just as ridiculous while giving them the gift of great hair! Underground Naturals' handmade, all natural bar soap is made using 100% all natural ingredients. A bar of soap should not strike fear into the heart of any human being. Taking a bath or shower should be one of the most relaxing parts of your day. However, with commercial bars floating around in your bath it is more likely that you are creating a toxic soup to soak in rather than creating a beneficial environment. Our government has set up many programs that work to protect the people of our country. However, when it comes to our health and beauty products we are left unprotected while large companies benefit from this serious lack of regulation. There are over 10,000 different chemicals being used in our body care products and a very small fraction of those have been tested and passed as safe for use. Couple all of that info with the knowledge that the number one chemical used in most bars of commercial soap is sodium lauryl/laureth sulfate. 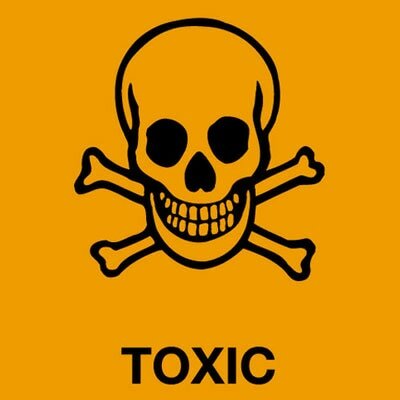 This nasty chemical will actually force your pores to open, allowing the toxic soup you are now sitting in to easily enter into your system. Underground naturals uses nothing but the safest, most gentle ingredients that effectively clean your skin without causing bodily harm. We start with olive oil, shea butter, and apricot kernel oil. All of these amazing oils are healthy and beneficial for your skin. Then, we add coconut oil that creates a beautiful, fluffy lather. Coconut oil is one of the best oils for cleansing the skin. Along with being gentle, it simultaneously becomes an effective cleaner. To give you an all-around perfect clean, we make sure that we add essential oils and essential oil blends that have been shown to have a myriad of benefits that positively affect your mind as well as your body. Your bath should be your chill-out moment of the day, not a chilling, fearful event! Relax with your favorite bar of Underground Soap. 1, 4 Dioxane is a petroleum-derived contaminant considered to be a probable human carcinogen by the U.S. Environmental Protection Agency, and considered to a definite animal carcinogen by the National Toxicology Program. It is part of a list of chemicals known or suspected to cause cancer and birth defects. However, you will never find it listed as an ingredient on any packaging because it is a contaminant produced during manufacturing, not added during the manufacturing process. Therefore, the FDA does not require it to be listed as an ingredient on product labels. 1,4-Dioxane is a manmade compound primarily used in industrial solvent applications in manufacturing. It is found in fumigants, automotive coolant, and is used as a stabilizer that prevents the breakdown of certain solvents during manufacturing. 1.4 dioxane is also used as a foaming agent and appears as an accidental byproduct in cosmetics manufacturing. Ethoxylation is a cheap process used by cosmetic companies to provide mild properties to harsh ingredients. This process requires the use of the cancer-causing petrochemical ethylene oxide, which generates 1,4-Dioxane. It is an eye and respiratory tract irritant, and is suspected to cause damage to the central nervous system, liver and kidneys. It has caused death because of accidental exposure. California has listed 1, 4 dioxane as a known carcinogen since 1988. It forms contamination plumes in groundwater after it has been released into the environment and has adversely impacted several areas around the world as it resists biodegradation. Testing sponsored by an independent consumers organization in 2008 found 1, 4 dioxane in almost half of tested personal care products. It is present in shampoos, liquid dishwashing soap, baby lotion, hair lotions, bath foam, food additives, mouthwashes, deodorants, and can also be found in shrimp, chicken, tomatoes, coffee, and some condiments. Bismuth is found naturally in the Earth’s crust. It is twice as abundant as gold but not economical to mine. The demand of this mineral would not be met by mere mining because it would make bismuth cost prohibitive for use in cosmetics. So, rather than use mining as a way of acquiring bismuth, it is produced as a byproduct in the processing of other metal ores such as lead, copper, tin, silver, gold, tungsten and other metallic elements. The difference between natural bismuth and bismuth oxychloride is the refining process. In its’ raw form many of its’ chemical properties are closely related to antimony and arsenic. In order for bismuth to be usable, it goes through the Betts Process. It is first run through an electrolytic solution of lead fluorosilicate and fluorosilicic acid. Then it is filtered, dried and smelted in order to further refine the ingredient. Because the bismuth is still not safe it is then put through molten caustic zinc and then chlorinated. This creates a toxic sludge called bismuth chloride. It is then treated with water, dried, and further treated with a diluted nitric acid solution of bismuth nitrate and sodium chloride. Only then does it become bismuth oxychloride. It has a pearl-like shine and has formed into crystals that give your skin a glow (or shine) that some women find annoying or tacky. The FDA has laid out strict regulations on bismuth oxychloride. They require it to be 98% bismuth oxychloride pure. However, it is not required to be free of lead, arsenic, volatile matter and mercury in specific amounts (not made public). The rules of the FDA are only followed if the bismuth oxychloride has been produced in the US or Canada. Sadly, across the world the laws are much less stringent, and many products are imported from other countries. Many women turn to mineral makeup in the hopes of finding a safe alternative to commercial makeups, only to find out that this heavy metal toxin is causing irritated skin, itching, rashes, and even mild to severe cystic acne. If you are looking to try mineral makeup, check to see if it contains this horrible ingredient. Even if your makeup is listed as “all natural,” look for bismuth oxychloride. When used it is like shoving tiny metallic particles into your pores, causing damage and leaving your body to fight this foreign chemical. 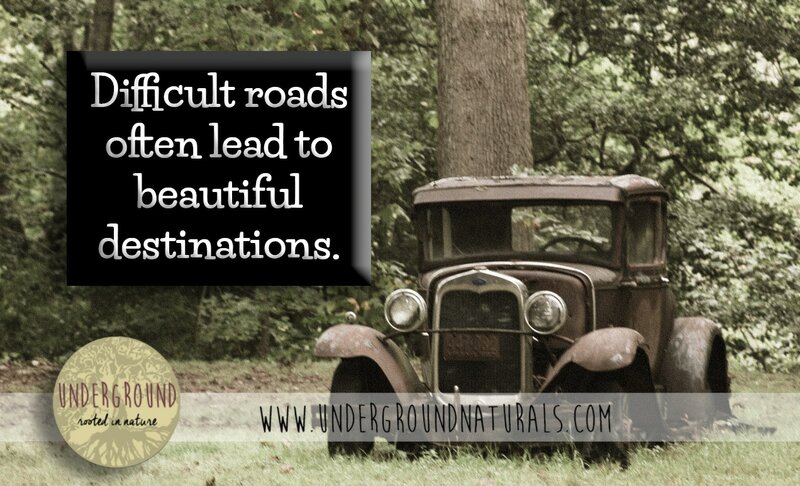 Underground Naturals begins with all natural ingredients that are rooted in nature. ​Why is what we do at Underground Naturals important? When you read the back of your shampoo bottle, do you know and understand all of the ingredients on that list? If you are like most of us, you don’t. You cannot even begin to understand what half of what you are reading actually means. …because the largest organ of your body is your skin, and it absorbs over 60% of what you put onto it. The average woman wears around 515 chemicals every day. From makeup, soap, face lotion, and perfume to cleaning the house with every cleaner known to man, we are introduced to chemicals. There are more than 10,000 chemical ingredients that are permitted in our personal care products, and many of them are hazardous to our health. If you are not convinced that your skin absorbs most of these chemicals, think about this: conventional lipstick is the most universally used beauty product in a woman’s arsenal. These beauty products actually contain some of the most dangerous chemicals and we willingly place these chemicals right on our mouths! Our bodies have been found to be filled with the chemicals that we willingly use consistently. According to www.fightchronicdisease.org, by 2030 almost half of the US population will be fighting chronic disease. From heart disease and stroke to cancer, normal Americans are trying to figure out why they are consistently sick. Many of these illnesses can be linked to the chemicals that can be found in our systems. Underground Naturals is dedicated to teaching you about the adverse effects of these chemicals and to help give you a better alternative to the products you use every day. Take time to read through our articles, and send us questions. We would love to hear from you. Reading labels can be tricky. As we gain more knowledge about the dangers sitting on the grocery store shelves, we are trying to make better, healthier decisions for ourselves and for our families. I’ve been doing this for a few years now, so here are some quick pointers that I would love to pass on to you as you learn how to search for safe health and beauty care. Don’t take for granted the front of the product when it says “Made With...” because that typically means that they have used just enough of the good stuff to get by, but that product is usually loaded with the ingredients you are trying to avoid. 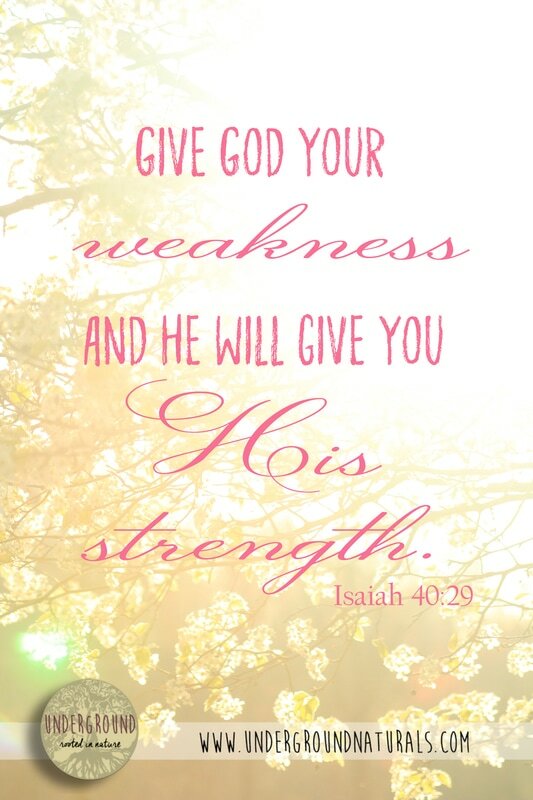 This is true with everything from food to your health and beauty products. Know the ingredients you are trying to avoid so that you can spot it quickly. For instance, when I am looking for a great all natural lotion, I see what they are offering on the front of the bottle, but I turn it over and start reading the ingredients, and even though I don’t understand all of those ingredients, I know that I want to avoid the most common dangerous chemicals like propylene glycol and dimethicone, so I look for them immediately. You don’t have to be a great scholar or have 3 degrees in your back pocket to be able to muddle through these seemingly complicated labels. Making wiser choices does take a bit of research on your part, yes, but it is not as difficult as we sometimes make it out to be. Sometimes it’s as easy as turning over a product. If you know what you want to avoid, you will begin spotting those ingredients right away. 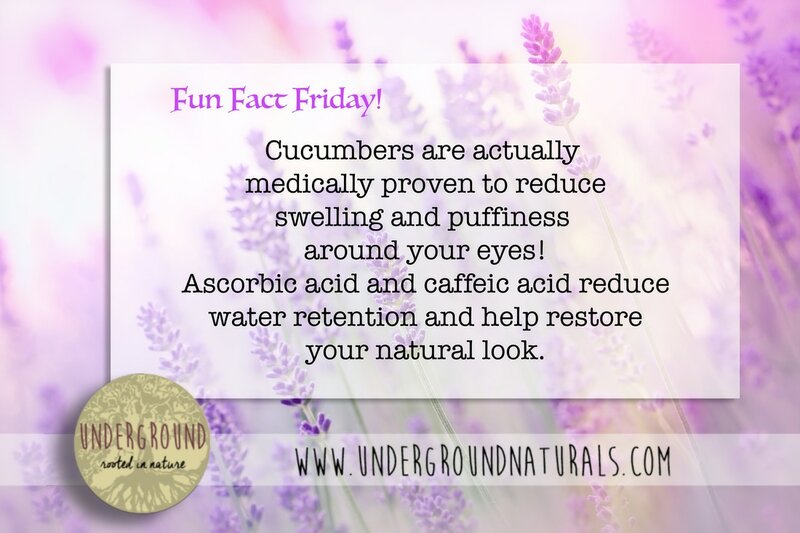 Cucumbers are actually medically proven to reduce puffiness and swelling around the eyes. Underground Naturals wants you to look your best, naturally. Underground Naturals wants to share the wonder of cucumbers with all of you. Cucumbers have amazing skin care qualities that could make you a believer. 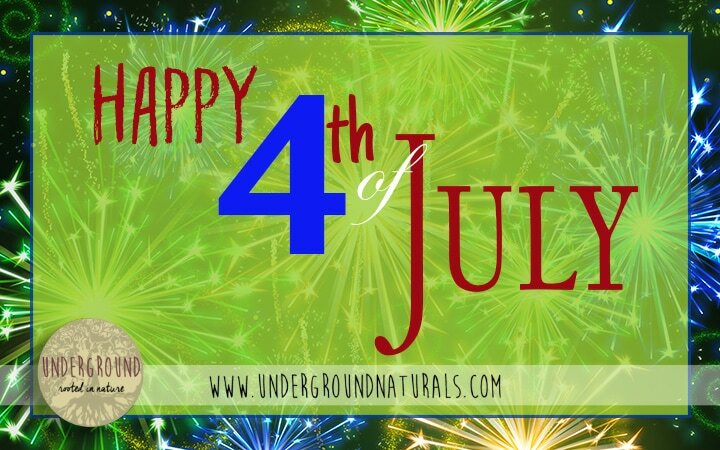 Underground Naturals is wishing you and your family a very happy 4th of July! 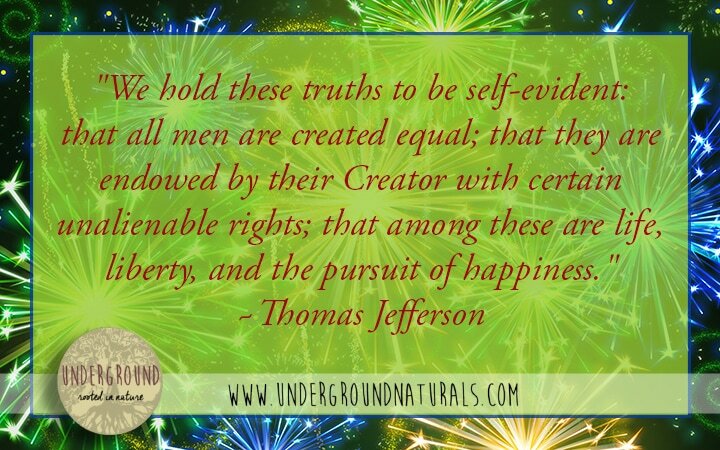 Underground Naturals loves this country, and we want to thank God for the freedoms that we still enjoy today. We also hope that everyone who has sacrificed and fought for our continued freedom knows and feels our gratitude. Have a happy and safe 4th of July! It is better to be absolutely ridiculous than to be absolutely boring. 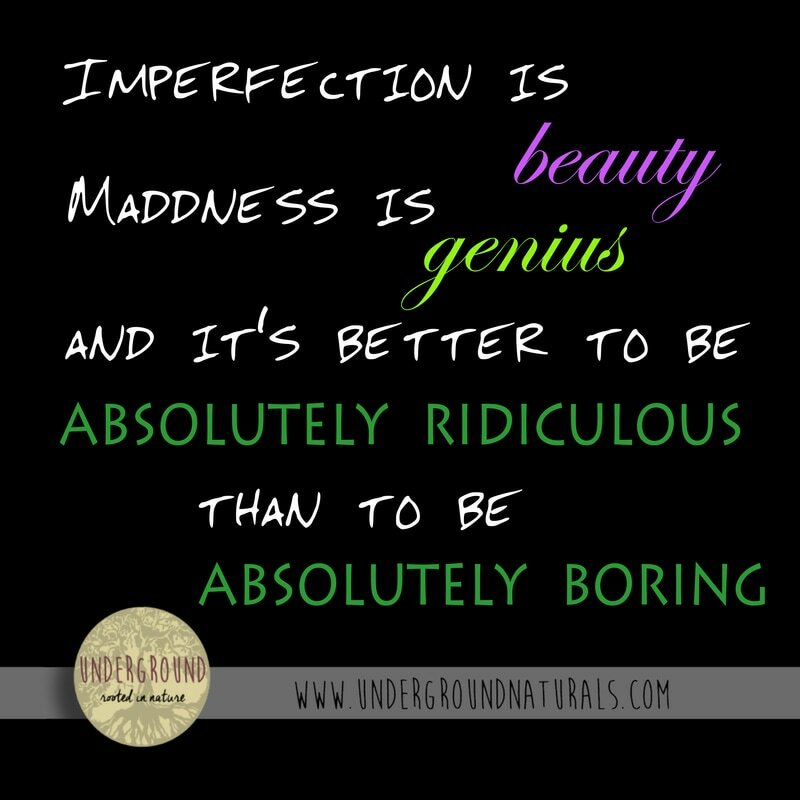 Underground Naturals is never boring! 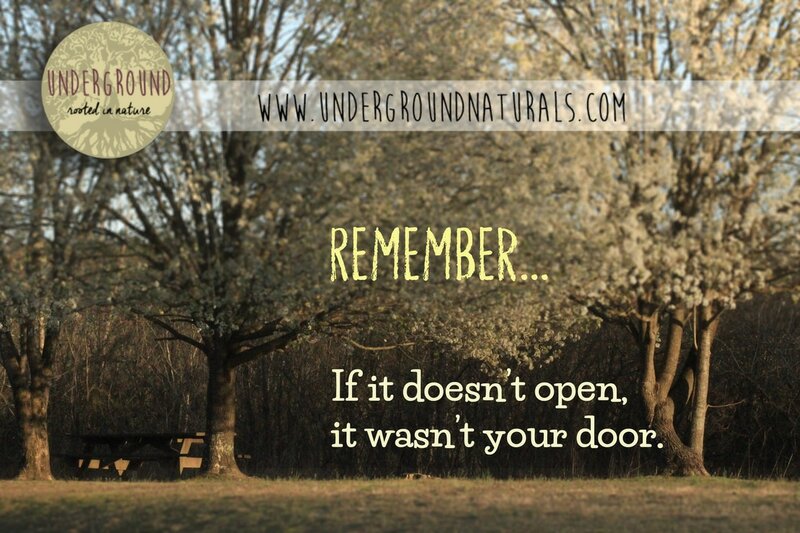 Encouraging words for you from Underground Naturals ...Remember, If it doesn't open it wasn't your door. Underground Naturals wants you to know amazing women of history. 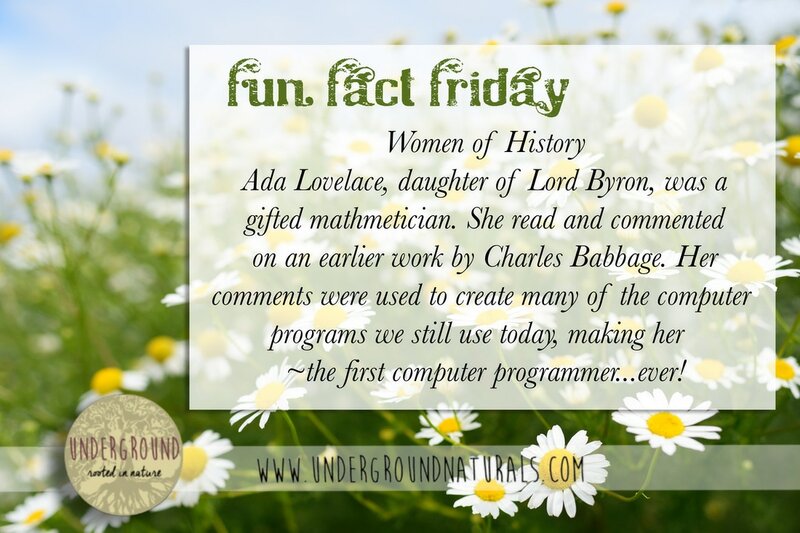 Ada Lovelace, daughter of Lord Byron, was the first computer programmer. 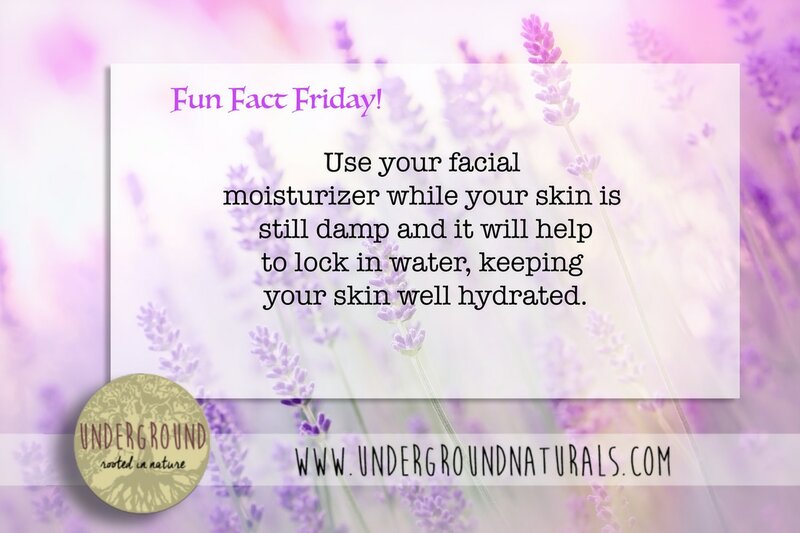 Underground Naturals encourages you to use your moisturizer while your face is still damp so that your skin better retains moisture. 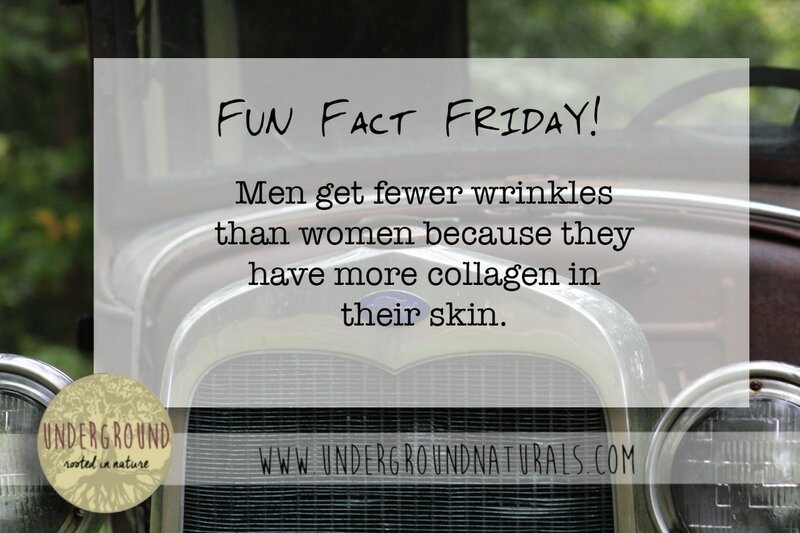 Men get fewer wrinkles than women because they have more collagen in their skin. Underground Naturals shares fun facts about men. 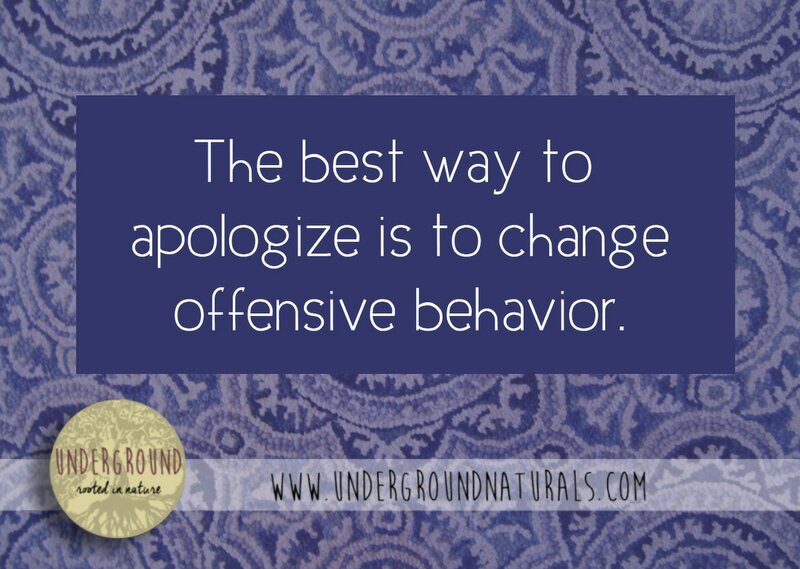 Encouraging words for you from Underground Naturals ...the best way to apologize is to change offensive behavior. Men spend almost an entire year of their life looking at women. Wash your hands before you wash your face. Underground Naturals wants you to look your best. 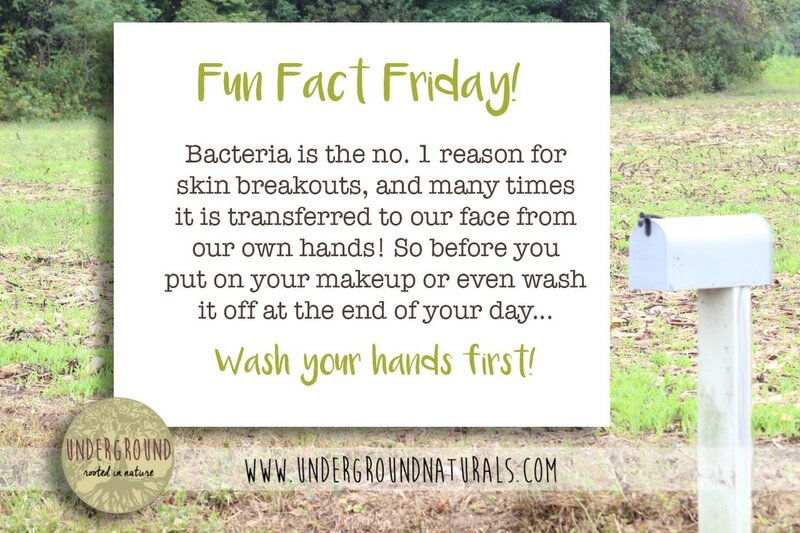 Bacteria can transfer from your hands to your face, so wash your hands before you wash your face. 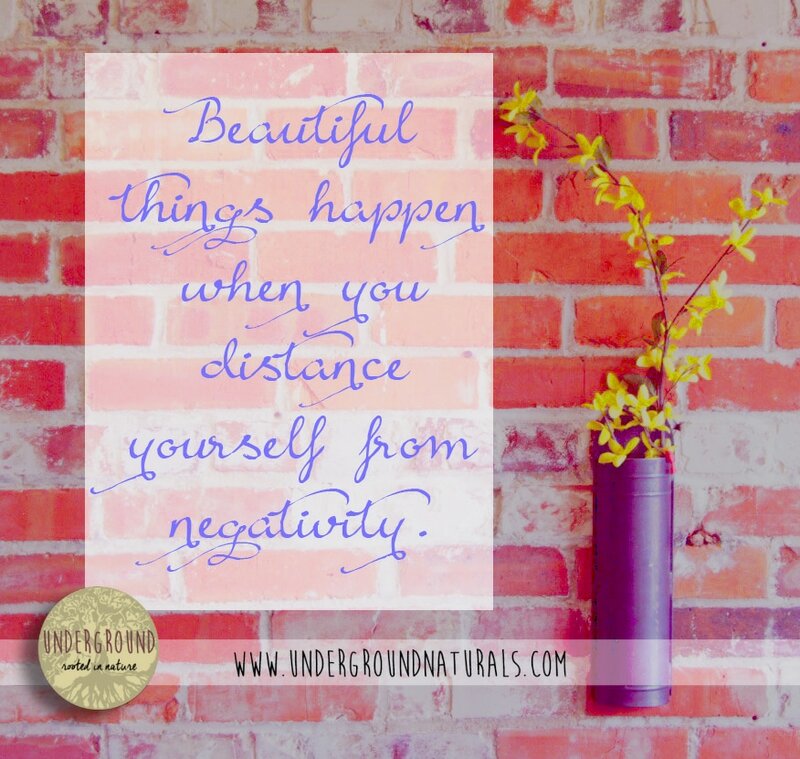 Encouraging words for you from Underground Naturals ...Beautiful things can happen when you distance yourself from negativity. 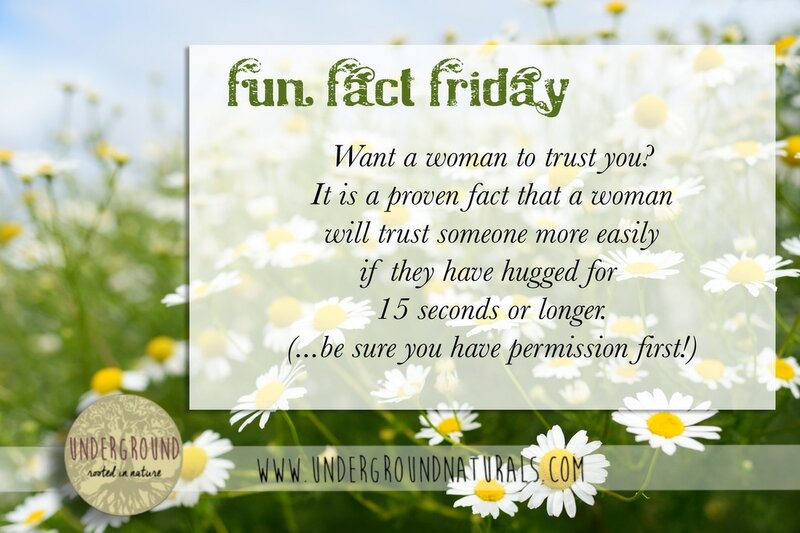 Fun Facts about Women with Underground Naturals. 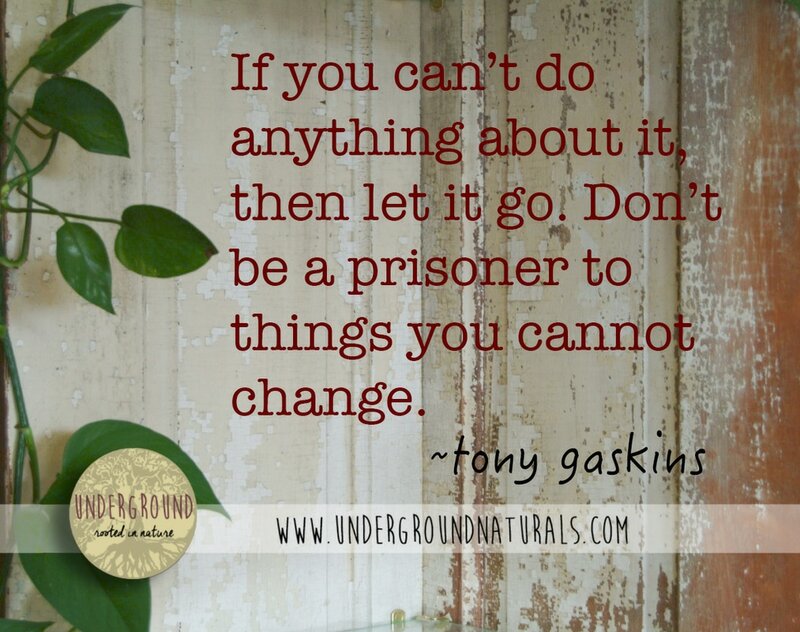 Underground Naturals is dedicated to providing all natural, safe, pure body care products for you and your family. Read our blog to learn more about why we do what we do, what ingredients you should avoid, and what ingredients we recommend.